All transactions are safe and secure with a reliable history in online purchasing behind each of our associates. 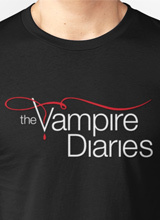 Buy the Vampire Diaries Logo t-shirt to own Vampire Diaries clothing and merchandise. Unlike The Vampire Diaries books and CW TV show, these Vampire Diaries t-shirts are simple and to the point. If you prefer Matt Donovan (Zach Roerig), Bonnie Bennett (Katerina Graham) or Jeremy Gilbert (Steven McQueen) to the Salvatore brothers, this tee might just be what you were looking for. It has no specific references to characters, and it features the show's logo on the front. If you can't get over the vampire duo, check out the Team Stefan shirt and the Team Damon shirt above. Any of our Vampire Diaries tees would be a great surprise for the fan in your life. In addition to the Vampire Diaries Logo tee above, browse the Vampire Diaries Clothing Gallery for more apparel like men's and women's clothes, kids shirts or hoodies.